Lutz & Gabi are grown up in Chemnitz, an industrial town in the state of Saxony in the eastern part of Germany. We know each other since we went to school. We have been married in 1982 and we have two grown up sons: Tom and Steve. Thanks to Lutz’s father, he started sailing with the age of seven years. His father built him a little sailing dinghy, a "Optimist". Lutz became quickly a member in a sailing club and he began very eagerly to participate in regattas. In the age of 12 years, Lutz changed the boat and started to sail a 420 dinghy. In 1979 Lutz & Gabi crewed together in a sailing boat for the very first time. In the following years this crew successfully participated in many regattas. After the German unification, we started to become interested in yacht sailing. 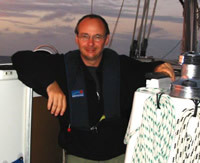 Lutz gained his first experiences in yacht sailing in the Baltic Sea in 1989. In the same year he obtained the navigational certificates. Since then Lutz & Gabi sailed thousands of nautical miles in the Mediterranean Sea, Thailand, Malaysia, Singapore and Australia mostly on charter yachts. Most of the time, Lutz acted as a "Part Time Skipper". 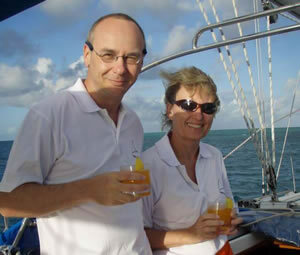 A big milestone towards our "Long Time Sailing" was the Atlantic crossing at the end of 2005 on the yacht "Blue Sky". Lutz & Gabi's professional carrier began with an apprenticeship. While Lutz opted for mechanical engineering, Gabi choose construction engineering. Later we both graduated in there engineering fields from different Universities in Chemnitz and Dresden. After we have started our professional live in Baden-Württemberg we felt a growing desire for adventures and we were looking for job opportunities in other, more exotic parts of the world. Eventually efforts have been awarded with success and we got very interesting but also highly demanding jobs in Malaysia for 4 years, followed by another assignment in China for a period of 6 years. Starting with September 2009 our live will change dramatically. We give up our professional carriers and entering the biggest adventurer of our lives.